These elements represent a complete and sophisticated docking system that depending on the individual loading situation offers decisive advantages over conventional internal ramps. They extend the available storage space and at the same time provide the building with thermal insulation. Hot-dip galvanization of the whole steel frame system is standard. Water drainage systems and façade elements matched to your building are also available as optional equipment. Thermal separation of the warehouse and the docking system guarantees a decisive reduction in energy costs – a very important factor for temperature-controlled warehouses and cold stores. Easy and fast assembly thanks to pre-mounted building elements that are put on existing foundations and fastened to the external wall of the building. If an already existing building is extended installation with the loading and unloading operations going on in parallel is possible. The cladding consists either of non-insulted trapezoidal sheet or of 40 mm insulated panel; it is also possible to use the same material as used for the façade of the warehouse. The system can be equipped with either a swing lip leveller or with a telescopic lip leveller as well as with various types of dock shelters optimally matched to the individual loading and unloading frequency. 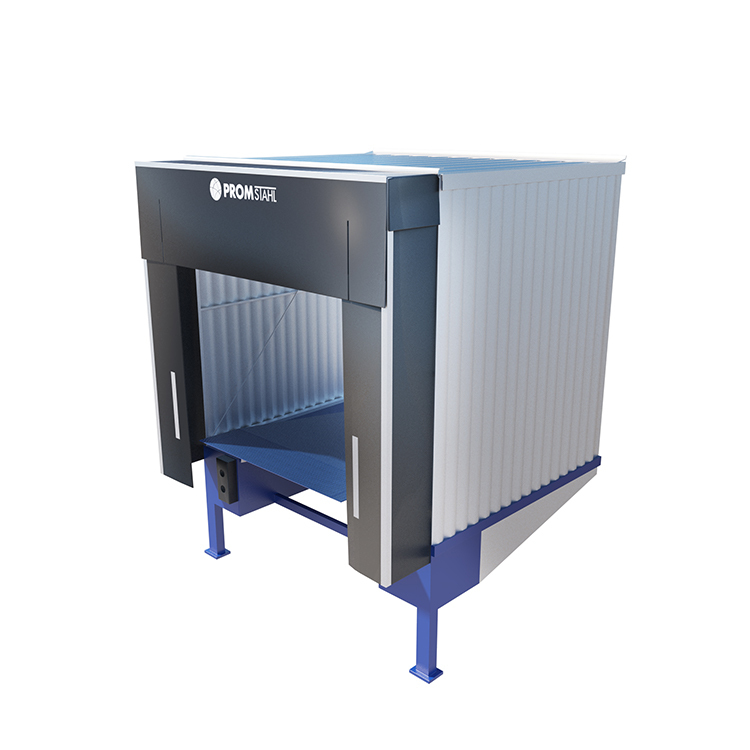 Thanks to its flexible modular design the PROMStahl loading house can be supplied either as a cost- effective multiple system or in the case of limited space available in front of the loading station as an angular arrangement or as a multiple serial system. Additional storage room is available in the warehouse since the whole docking system is placed outside the building. It is even possible to benefit from shorter tax depreciation regulations. Please contact your tax consultant regarding this topic. Respect the local building regulations! We reserve the right to alter technical specifications.